Sometimes I think it's interesting how people (I) end up coming up with the meal for the evening or a new recipe for that matter. Sometimes I do sit around thinking of new flavor combos, textures, and such. Other times, the recipe and/or meal happens because I have something else that needs to be used. Last night I had some homemade ciabatta that I wanted to go ahead and use before it ended up being wasted. That would just be a travesty right? 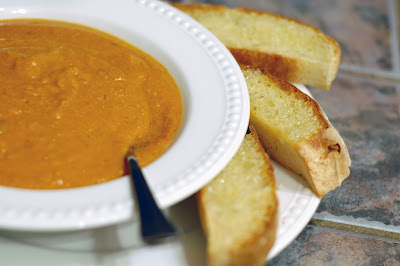 Soup sounded like the appropriate fit for the bread - you know, so you could sop up something yummy with it. I have a pretty decent stash of pumpkin right now, so I decided on a pumpkin soup. But I didn't want a mild soup. I've actually been craving super spicy foods recently. I always like spice, but it's been way out of control all of the sudden. I had some chipotles in adobo sauce, so I decided to go with the smoky flavor profiles. Pumpkin can be really mild, almost sweet, so it can pair well with heat (in my opinion). I wanted creamy, and I wanted to make sure to include protein, so I used a silken tofu to give it creamy texture sans cream. In a large soup pot, saute onions and garlic. Add in remaining ingredients. Use either an immersion blender or regular blender, puree until smooth. Return to heat and allow to simmer approximately 30 minutes. Re-season as needed. I'll admit that it was pretty spicy. But I love the smokiness from chipotle peppers as well as the cumin and chilli powder. You could easily adapt this to your heat preferences. And if you can't have soy, I think that almond milk would work or perhaps adding in some cashew cream. Speaking of cashew cream, I think a swirl on top of the soup would have been lovely. It's that time of week again - Way to Go Wednesday. As always, please share your shout outs for the week! Danielle at It's a Harleyyy Life for being able to race after having a broken sternum. Team Zippy (Amanda & her daughter and her son & his friend) kicked booty at the Rudolph Run 4-mile relay. The boys took 2nd overall male and the girls took 3rd overall female! Pavement Runner for an awesome year of running that included 12 races and 38 miles "for fun."